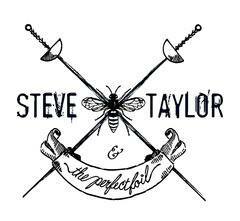 Nashville, Tenn. (December 11, 2013) – Acclaimed filmmaker, writer, producer and recording artist Steve Taylor, director of the Blue Like Jazz movie, is taking a sabbatical from filmmaking to release his first studio record in 20 years with his new band, Steve Taylor & The Perfect Foil. Teaming up with veteran musicians Jimmy Abegg, John Mark Painter (Fleming and John) and Peter Furler (Newsboys), Taylor raised over 150% of the funds needed to record the album via a wildly successful Kickstarter campaign that features a video of his comical attempts to renew his "license to rock" at the DMV (Department of Music Veterans). Setting a goal to raise $40,000 in 28 days, Steve Taylor & The Perfect Foil raised the appropriate funds needed to record and produce the new album in only 36 hours. Because of the unexpected success, the band has added a variety of stretch goals onto their Kickstarter campaign in order to raise funds for their first tour as a band. Fans can pre-buy a ticket by adding the $25 cost to a specific backer award that they’ve already chosen. Depending on additional funds raised, the band is aiming towards a full U.S. tour with sights set towards a potential international leg. For more information on how to support the album and tour, visit: http://www.kickstarter.com/projects/2128223578/steve-taylor-and-the-perfect-foil-new-album-really. Filmmaker Steve Taylor earned his “Renaissance Man” stripes (Prism Magazine) from a uniquely diverse body of work. As a recording artist he’s sold over one million albums worldwide, earned two Grammy nominations for Meltdown (1984) and Squint (1993), and made history as the only artist to twice win Billboard Music Video Awards for self-directed music videos. Steve was also lead singer/co-writer in the MCA-signed modern rock band Chagall Guevara. His producer resume includes the Platinum-certified Sixpence None The Richer (featuring the hits “Kiss Me” and “There She Goes”), three Gold-certified albums for Newsboys, and tracks for Relient K and Third Day. In 1997 Steve launched Squint Entertainment, whose worldwide success in the pop music arena was a first for a Nashville-based label. In addition to Sixpence, Squint’s roster included Chevelle, Burlap To Cashmere, and hip-hop collective L. A. Symphony. Steve’s parallel career as a filmmaker began in college and includes his video for Sixpence’s “Kiss Me,” the long-form Newsboys comedy Down Under The Big Top, and the award-winning Squint: Movies From The Soundtrack. 2006 marked the release of Steve’s debut as a feature film director/writer/producer with The Second Chance, an award-winning drama that was distributed theatrically by Sony Pictures Releasing. In 2012, Steve Taylor worked as the director/co-writer/producer on the film Blue Like Jazz, an adaptation of Donald Miller’s New York Times bestselling memoir. The film won the 2013 Wilbur Award for Best Feature Film, joining past winners The Help, Schindler’s List and Dead Man Walking. Steve lives in Nashville with his wife, the artist D.L. Taylor, and their daughter.